To customize Google Talk, you need to open the Settings dialog box. To open it, click the Settings link in the upper-right corner of the Google Talk window. Start automatically when starting Windows If you select this option, Google Talk automatically starts whenever you start your PC. Disable the check box, and you have to start Google Talk manually instead. Open Gmail when I click on email links This setting affects Gmail, rather than Google Talk. If you enable this check box, you open Gmail rather than an email program such as Outlook when you click an email link in a website. Sort Friends by name This option sorts your friends list alphabetically. Hide offline Friends This option hides the names of your friends who are offline; it's most useful if you have a very long friends list. Hide Gmail contacts not on my Friends List Use this setting only if you've chosen to list all your Gmail contacts in your Google Talk friends list. When you make this choice, any of your Gmail contacts you have not already put on your friends list do not appear in your friends list. Add people I communicate with often to my Friends List If you enable this option, people with whom you often exchange email are added to your friends list. Show when I'm chatting Select this option, and when you're engaged in a conversation with someone (either text messaging or voice chatting), the word Talking shows up on anyone's friends list whom has you listed as a friend. The Account settings button has nothing specifically to do with Google Talk. Instead, it brings you to your overall Google account settings. For details, see Chapter 1, "Start Here." Enable diagnostic logging Click this button to turn on this option only if you've having problems with Google Talk, and a Google Talk technician has specifically told you to turn it on. This option is only used for troubleshooting. Play sound Enable this option to play a sound (a kind of repeating chime) when you have an incoming call or an incoming chat. Show notification Enable this option to display a notification when you have an incoming call or incoming chat; a pop-up window appears just above the Google Talk icon in the system tray. For new email, you also have a choice of whether to show a notification. For more details, see About Browsing and Reading Gmail from Google Talk. You can also disable all notifications by choosing the Disable all notifications option at the bottom of the screen. For information about the Blocked and Privacy settings located in the list on the left side of the screen, see Protect Your Privacy. 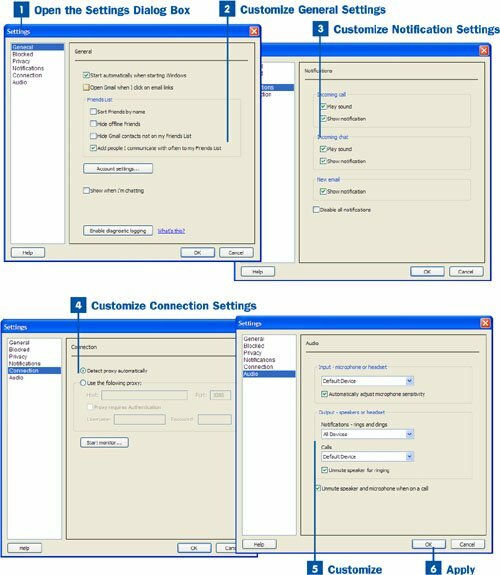 The Connection section (click the Connection option in the list on the left side of the dialog box) enables you to use what's called a proxy server. You'll likely need to use this option only if your company requires the use of a proxy server. Ask your company's technical support department for proxy server settings, ask if you're required to use them, and then fill in the fields in the Use the following proxy section. Proxy server A server that provides Internet security by shielding you from direct connections over the Internet. Your PC makes a connection to a proxy server, which then makes the connection to the Internet. The Start monitor button launches a monitor that watches and tracks Internet use. The monitor does not offer any text reports, but you can watch it on screen in its own window. The monitor watches only your Google Talk use, not any other kind of Internet use. The monitors technical thingsprotocols used, IP addresses, and more. Input - microphone or headset The drop-down list in this section enables you to choose your system's default device for your microphone or headset (this is recommended), or you can instead choose a different one. You can choose from only those options on the list. In this section, you can also choose whether to have Google Talk automatically adjust the sensitivity of your microphone to match your voice level. Output - speakers or headset The options in this section enable you to choose which devices should be used for notifications of incoming calls and the sounds for outgoing calls. You can choose your system's default device for your microphone or headset (this is recommended), or you can instead choose a different one. For example, you might have several audio devices installed on your systema headphone as well as separate speakersand the headphone might be set as the default. If you want, you can choose to make the speakers the default device. You can choose from only those options on the list. Unmute speaker and microphone when on a call This option ensures that your microphone and speaker are not on mute when you're making a call using Google Talk. When you are done adjusting the settings for Google Talk, click OK to apply them to your current Google Talk session. You do not have to reset your computer or close and relaunch the application for the new settings to take effect.